The culmination of celebrations to mark the 40th anniversary of Interfaith Wolverhampton happened in a spectacular manner on 25 November 2014. The Prince of Wales and the Duchess of Cornwall agreed to grace us with their presence even though they had a hectic schedule of commitments in Birmingham and elsewhere in Wolverhampton. Their motorcade was preceded by the arrival of Dr Tim Watts, the High Sherriff of West Midlands and his consort Julia Watts, soon followed by Mr Paul Sabapathy, the Lord Lieutenant of West Midlands and some members of the royal retinue. Excitement on the faces of the large number of school children waving hand-crafted flags was tangible as they lined up the route from the front of the Royal School to the theatre which, after the arrival of the royal party, witnessed some talented performances by children on stage. The theatre was full to capacity with people of all faiths, denominations and ethnicities, all eager to catch a closer glimpse of the Royal visitors. 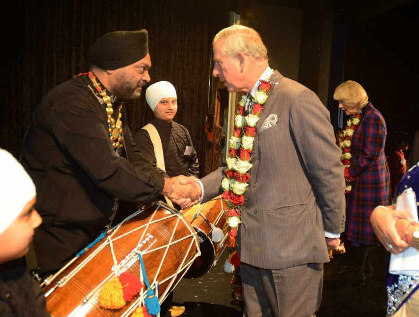 As they approached the door of the theatre, the beaming Royal Highnesses were greeted by a rousing rendition by Azad Dhol players. The Royal couple chatted enthusiastically with the children lining their route. A brief introduction to some of the inviolable principles driving much of the work of Interfaith Wolverhampton was given by its chairman Harun Rashid. He gave a thumbnail sketch of the circumstances that gave birth to the group and outlined some of the initiatives being undertaken in the near future. Entertainment was then provided by a number of performers from diverse cultures and traditions. Azad Group, once again, briefly played Dhol to trigger a surge of adrenaline through the audience for the ensuing session. They were followed by members of the Serenity Group who sang an Arabic song interspersed with some English words to aid understanding. Shantel Hyatt, a Youth Probation Officer, regaled the audience with gospel singing and Pete Hepworth entertained with an English folk song. The rousing finale captivated the audience with a Bollywood dance performed by children from the Gujarati Association. 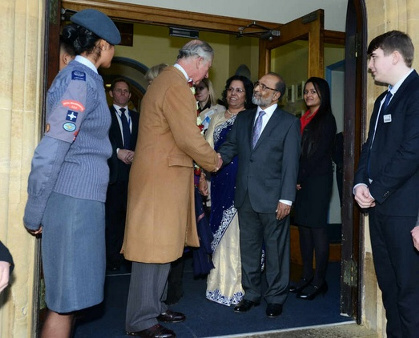 After the performances, the Prince of Wales and the Duchess of Cornwall, accompanied by Mark Heywood, head teacher at the Royal School, Harun Rashid and Parveen Brigue proceeded through to the Great Hall for a reception. In the meantime, the Rt. Rev. Clive Gregory, President of IFW, presented the performers with certificates. 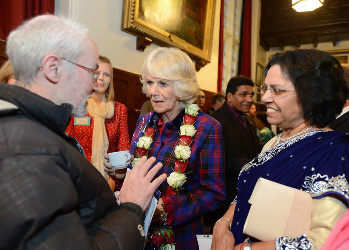 In the Great Hall, the Prince of Wales and the Duchess of Cornwall met members, staff and supporters of Interfaith Wolverhampton, community groups and School Staff. 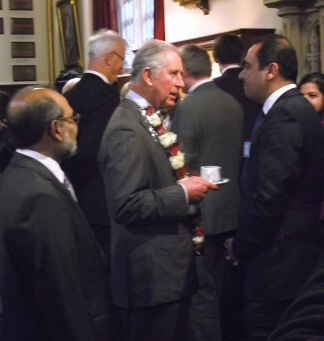 The Royal visitors showed a sound understanding of issues around interfaith dialogue and community cohesion and had a brief conversation with most people gathered there in a relaxed way. Copies of the DVD of the Royal Visit are available for £10 from the office.